The apple is also known as Sussex Forge and arose at either Forge Farm or near old iron forges around East Grinstead. Robert Hogg described it in 1851, but by then it was well known. The variety is known as the “Cottagers Apple” and was widely grown in north Sussex and Surrey in the nineteenth century. It is still found around East Grinstead. “A very old variety extensively cultivated throughout Sussex, where it is one of the most popular apples for dessert and cooking. This old variety still has many supporters,” wrote H.V. Taylor in 1948. It is currently cultivated as part of Brighton Permaculture Trust’s National Collection in Stanmer Park, Brighton. You can see a Forge apple tree (planted 2011) in Home Farm Orchard, Stanmer Park ( map). Soon after picking, the Forge apple has a sharp tannic flavour but mellows to be almost rich, lightly aromatic. It cooks to a soft, lemon coloured purée which tastes quite brisk and fruity. It also makes good sauce. The fruit is a pale green-yellow with a light orange flush and a little red. 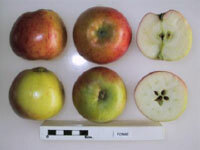 Medium in size, the Forge apple is conical to round conical, with a short thick stalk. Basin broad, quite deep; ribbed. Eye closed; sepals short, thick. Cavity narrow, shallow; little russet. Fruit can be picked late September and stored through December or even March if kept very cool. The Forge apple tree is very resistant to scab.